Explore Colaba on the 3-hour bicycle tour with an expert guide, nothing compares to the simple pleasure of riding a bicycle in the calmness of the night. As rightly said, "It’s not a race, it’s a journey - enjoy every moment". Midnight cycling tour which takes your around some of the most iconic places of the 'City of Dreams'. Approximately 25 kilometres of a cycling tour letting you explore Mumbai during the midnight hours. Service of a tour leader during the whole experience. There are various reasons why everyone should put a metal tube between their legs & pedal off. Cycling is a healthy, low impact activity which does not require high levels of physical skills. It’s good for your heart, it boosts your immune system, decreases stress level, good for strength & stamina. Moreover, biking exercise releases natural feel-good endorphins that help counter stress and make you happy. You will have to report at Navy Nagar in Colaba, South Mumbai at 11 PM and meet your host & guide for the tour. After short sessions of group introduction and tour briefing, bicycles will be allocated to the members you opted for rented bicycle option. You will have some time to warm-up and try out the bicycle before you begin the tour of Colaba. Start the tour and pedal past The Gateway of India, Marine Lines, Haji Ali Dargah and lastly Bandra-Worli Sea link. The Gateway of India: The iconic monument is one of the most popular attractions of the city and a popular place in Colaba. A symbol of the British Raj era, the structure was completed in 1924 to honour the visit of King George V and Queen Mary. Marine Lines: A military establishments built in the 19th century by the British, Marline drive along the promenade and has one of the finest Art Deco Residential Buildings facing the sea. Haji Ali Dargah: A popular mosque located at the islet off the coast of Worli. Dedicated to a Sufi saint, Pir Haji Ali Shah Bukhari, the mosque is one of the most recognisable landmarks in Mumbai. Bandra Worli Sea Link: An iconic structure of modern Mumbai, Sea Link is a cable-stayed bridge which has reduced the travel time from Bandra to Worli from 20-30 minutes to just 10 minutes. We'll take a snack break once in Worli by midnight, have some snacks and play fun games at Worli sea face. After the break, start the return journey to Colaba, the tour is expected to end latest by 2:00 AM (approximately, depending on the riding speed). Bicycle rental charge for rented bike option. Helmet for rented bike option. Goodie bag from the host. Service of a knowledgable host & guide for the tour. Members below 12 year of age are not allowed on the tour. Smoking and drinking are strictly prohibited during the tour. Mention about any allergies that you may have in the "Special Request Section" during the booking. 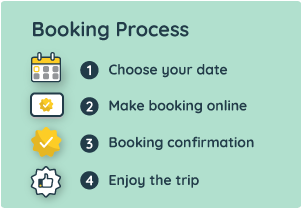 The exact reporting address, contact number and other details of the tour operator are shared in the booking voucher, sent to you via email after booking.